Home New catalog Swaps and more swaps!! This week has been very busy making swaps and working on a wedding as well! I am getting down to the wire with everything for convention!! I am so excited! 5 Members of my Stampin’ Up! team are going with me to Salt Lake City next week for Stampin’ Up!’s 25th Anniversary Celebration!! It will be so much fun!! This is a card that I designed with the Mosaic Madness stamp set and Quatrafancy designer paper. I actually made this card in two color combinations since my supply of cardstock is more limited on the Cape. The first sample is using the new Strawberry Slush paper and ink with pink pirouette on top and the mosaic embossing folder. Remember that the mosaic punch and stamp set come as a bundled pair! 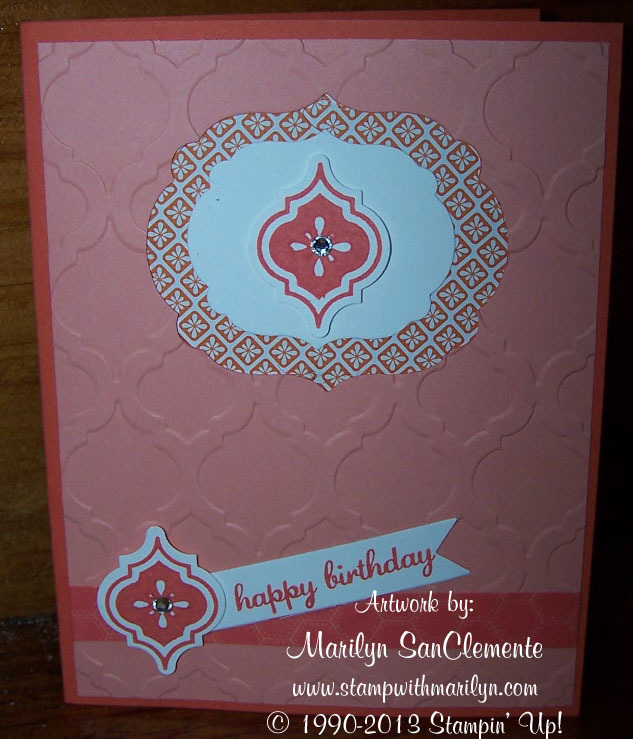 The second card is the same layout but using the Crisp Canteloupe color scheme with Calypso Coral as the backing. I added a little bling to the cards with rhinestone jewels on the mosaics. For the cutout, I used the labels collection framelits. The trick to this card is to cut out the top layer with a larger framelits and then emboss the top layer with the mosaic embossing folder. I then cut a smaller piece of white card stock using the smaller label framelit. I used the new Washi tape along the bottom of the card where I layered the mosaic that I stamped and punched. The strawberry slush card uses the washi tape from the Gingham garden washi tape. The calypso/canteloupe card uses the Epic Day washi tape. 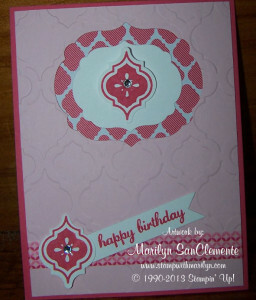 Last but not least, I used the happy birthday stamp from the new hostess set Express Yourself. I love all the greetings that this set offers. Enjoy! Marilyn SanClemente, mosaic madness, STampin' Up! cards. Bookmark.